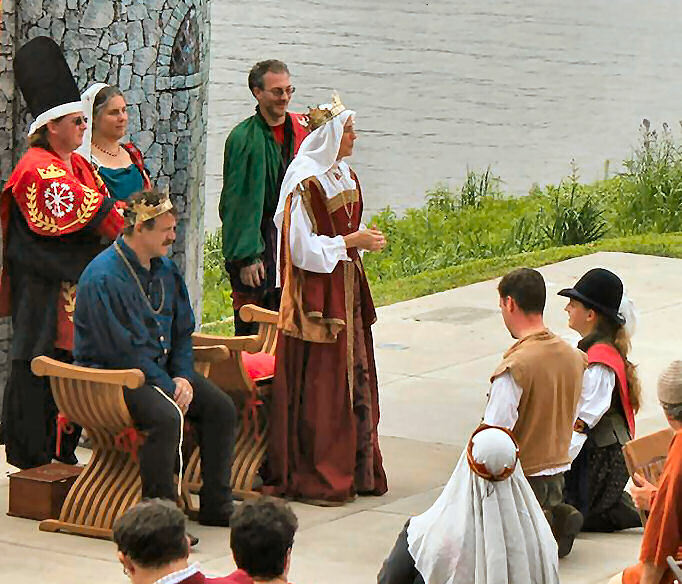 Documented from the Scrolls of the Reign of Timothy & Gabrielle II, King and Queen of Æthelmearc: the Business of Their Majesties’ Court at the Lake Augusta Renaissance Festival, 20 June Anno Societatis L, in the Shire of Abhainn Ciach Ghlais. As recorded by Their Silver Buccle Herald, Kameshima-kyō Zentarō Umakai. Their Majesties called forth the children in attendance and presented them with treat bags that they might have something to amuse themselves through Court. Sir Hauoc the Wild was invited to speak of the day’s bear pit tournament, and he announced that THL Murcadh Dal Cais, aka “Uncle Pat” had bested all others and proven himself victorious. THL Murcadh Dal Cais, tourney winner. Photo by Lady Christina Mary Lowe, aka Jinx. 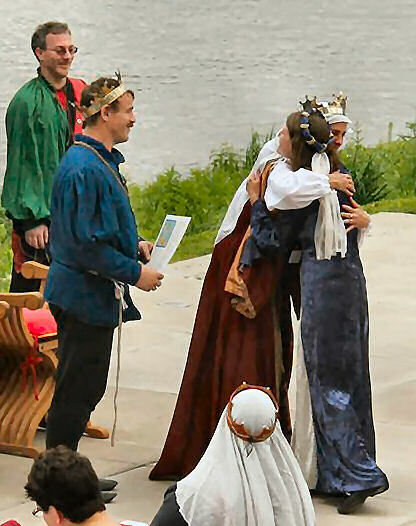 Meghan of Beck the Innkeeper was Awarded Arms for her diligence in promoting the Society, most importantly through the Sunbury Renaissance Initiative and the Lake Augusta demo. Scroll illuminated by Lord Angellino the Bookmaker and calligraphed by Lady Ylaire Sainte Claire. Lady Meghan of Beck the Innkeeper. Photo by Jinx. 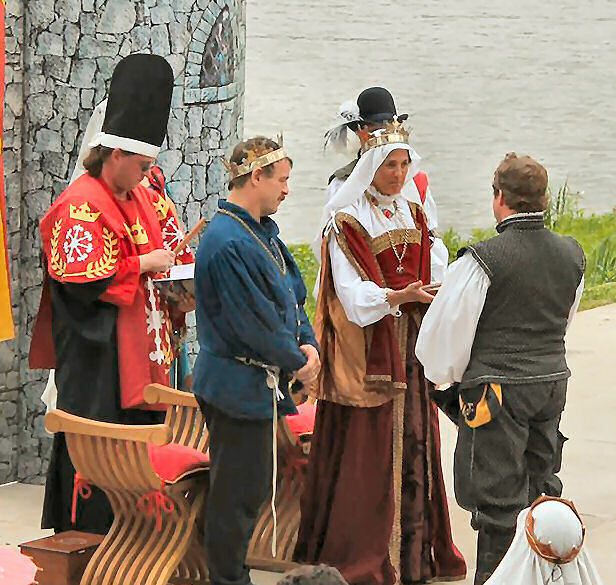 Lord Nicodemus ben Mordecha was inducted into the Order of the Keystone for his years of service to the shire as cook, fencer, teacher, and autocrat, including being the autocrat of the day’s festival. Scroll illuminated by Maria Adriane of Delftwood and calligraphed by Kameshima-kyō Zentarō Umakai. Lord Nicodemus ben Mordecha receives a Keystone. Photo by Jinx. Raven Hilde re Novgorod was Awarded Arms and elevated to the Order of the Golden Alce for her relentless pursuit of skill in heavy weapons, both in and out of Æthelmearc. Scroll by Master Jonathan Blaecstan. Lady Raven Hilde re Novgorod is inducted into the Golden Alce. Photo by Jinx. 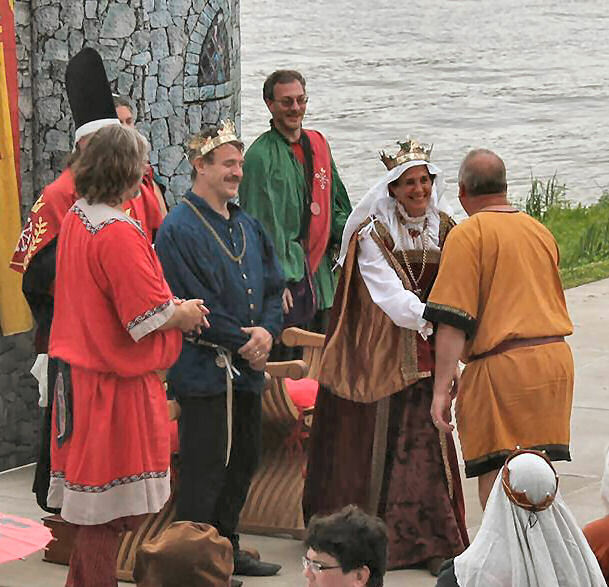 THL Margeurite d’Honfleur was issued a Writ of Summons to contemplate elevation to the Most Noble Order of the Laurel for her mastery of the art of the clothier, making our Society a more beautiful place through the garb that she creates. Writ by Mistress Alicia Langland. 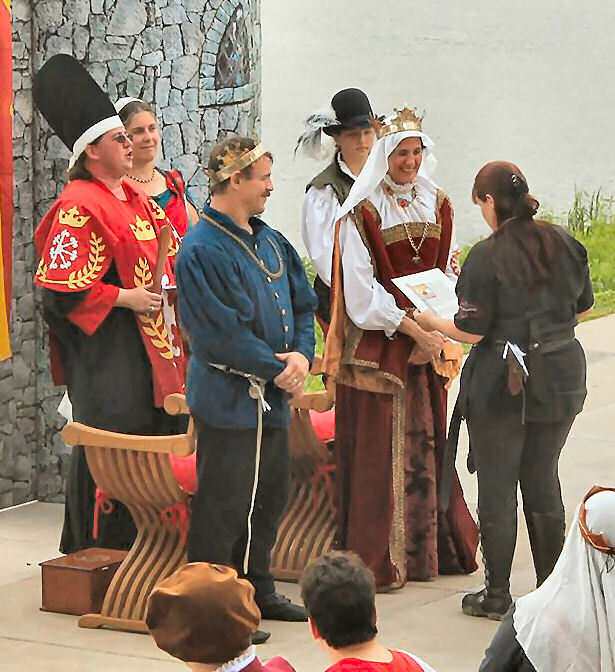 THLady Marguerite d’Honfleur receives a Writ for the Order of the Laurel. Photo by Jinx. Don William Parris and THL Fiora d’Artusio were summoned forth to receive Her Majesty’s token of inspiration for their creation of the balloon rapier target for the day’s youth activities, allowing those children present to participate in the art of fencing that they both so truly love. 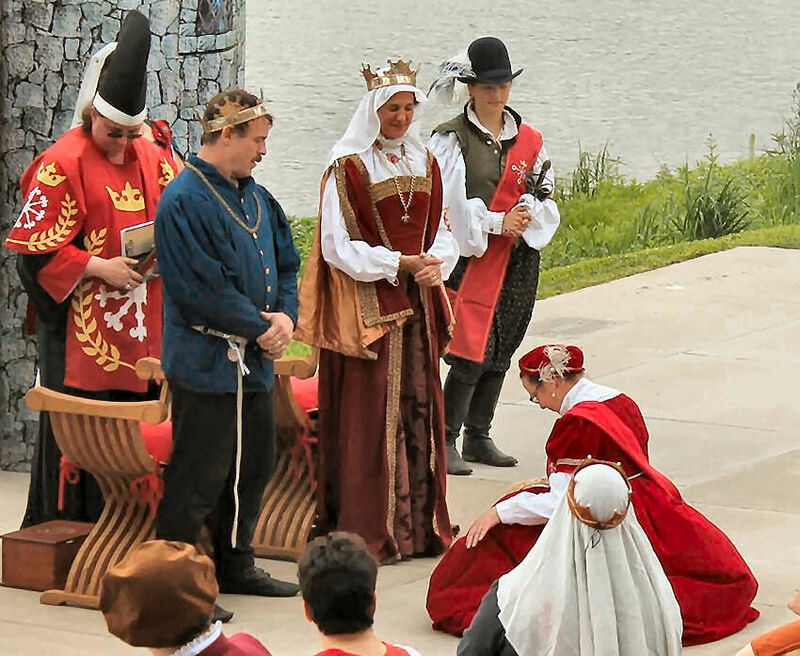 Don Will Parris and THLady Fiora d’Artusio receive the Queen’s token for inspiration. Photo by Jinx. Those who had donated time and effort towards the scrolls given out that day were invited to stand forth and be recognized. There being no further business, Their Majesties’ Court was closed.